A mob of perhaps 30,000 people advanced toward the Tuileries Palace to capture King Louis XVI on August 10, 1792. John Adams stands as an almost tragic figure. Rather than continue to use the exigencies of war to build his own popularity and to justify the need for strong federal authority, Adams opened negotiations with France when the opportunity arose to work toward peace. Reconciling with France during the critical campaign of 1800 enraged many Federalists, including Adams' own secretary of state who repeatedly refused to send peace commissioners to France. Hamilton, ever the shrewd political operator, denounced Adams' actions, for a quasi-war clearly could stimulate patriotic fervor. This might help Federalists win the upcoming election. In the end, Adams only convinced the Federalist Congress to move toward peace by threatening to resign and thus allow Jefferson to become president! Vilified by his political opponents and abandoned by conservatives in his own party, Adams would be the only one-tern president in the early national period until his son suffered the same fate in the election of 1828. John Adams was a complex figure. A vain man who took offense easily, he also acted honorably in refusing to exploit war with France for personal and partisan gain. Such deeply principled actions marked his public career from its earliest days. Since 1765 Adams had been at the forefront of what would become the Revolutionary movement. Although not a striking speaker, his commitment and thorough preparation made him a key figure in the Continental Congress where he served on more committees than any other individual. 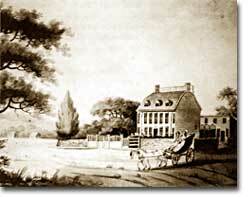 John Adams grew up in Braintree, Massachusetts, on the farmland his great-grandfather had cleared 100 years earlier. Unquestionably an ardent patriot, Adams felt so strongly about the rights of the accused to a fair trial that he represented the British troops who had fired in the Boston Massacre of 1770. Adams argued their case so well that they escaped criminal penalty. During the Revolution, as well as while president, John Adams allowed his principles to determine his course of action even when they might be deeply unpopular. Adams' life was marked by many deep contradictions. His conservatism led him to the top of the Federalist Party that by 1800 had become a minority group of elite commercial interests. However, he himself was a man of modest origins who had achieved great success through personal effort. The first in his family to attend college, as well as the first to enter a profession (as a lawyer), Adams became caricatured as an elitist. Meanwhile, the slave-owning gentleman Jefferson successfully campaigned as a defender of the common man. The new nation that Adams had done as much as any to bring into being was fast becoming a place whose values he did not share. Adams rightly felt misunderstood and persecuted. Writing to another aging patriot leader in 1812, he explained, "I have constantly lived in an enemies Country." Toward the end of his long life, Adams renewed an earlier friendship with Jefferson that had understandably dissipated in the 1790s and with the election of 1800. In their waning years these two towering figures began a rich correspondence that remains a monument of American intellectual expression. Adams' conservatism exerted itself in a core belief that inequality would always be an aspect of human society and that government needed to reflect that reality. A sketch of the just-completed White House in 1800. Furthermore, Adams emphasized the limits of human nature. Unlike the more optimistic Jefferson, Adams stressed that human reason could not overcome all the world's problems. Less celebrated in both his own day and ours, Adams' quiet place among the Founding Fathers is related to the acuity and depth of his political analysis that survives in his extraordinarily voluminous writings. Adams persistently challenged and questioned the soft spots of a more romantic and mythical American self-understanding. In Benjamin Franklin's estimation, Adams "means well for his country, is always an honest man, often a wise one, but sometimes, and in some things, absolutely out of his senses. John Adams was on a diplomatic mission to England during the Constitutional Convention, so his first experience with the document was reading it, without hearing the debates that accompanied its creation. A few years after his return, Adams "...had the honor to be elected to a station under the new order of things, and I have repeatedly laid myself under the most serious obligations to support the Constitution." In his inaugural speech Adams pledges to support liberty, his country, and the Constitution. Painter Gilbert Stuart composed portraits of scores of people important to the Federal period of American history, and the National Gallery of Art owns 41 of his works. Born in Rhode Island, Stuart trained and worked in Europe for almost 20 years before returning in 1793. A better view of the John Adams painting. What did John Adams do before he was President? He was a teacher, a lawyer, and a Continental Congressman. There's a lot to explore on this site; there are plenty of links within the story of pre-President Adams, and when you finish you can move on to his campaigns and elections. A scholarly essay comparing John Adams' political ideas to the Vindiciae contra tyrannos, a political theory book by French Calvinist Duplessis-Mornay. The author of the essay actually places Adams' writings within the context of 18th century history, so you can get a sense of what propelled Adams to write what he did. There's also a short but decent biography of Adams' youth. Thomas Jefferson owned 5,000 acres of land in Virginia and over 170 slaves. John Adams and Thomas Jefferson began exchanging letters in 1812, the same year wood pencils were first manufactured in the United States.